Furthermore, Intravenous drug users (IVDUs) requiring naloxone after heroin overdose are a unique population that place prehospital health care providers (paramedics/EMTs and other ambulance personnel) at an especially high risk for blood borne pathogen exposure. [1-3] Since all of these patients rarely need intravenous access for any reason beyond the administration of naloxone (Narcan), a method of administering naloxone without a needle would be preferable. [4-6] Fortunately, naloxone is a small molecule that easily crosses the nasal mucosal membranes. After intranasal (IN) administration, naloxone exhibits opiate antagonist effects almost as rapidly as the IV route with bioavailability approaching 100%. [7, 8] Based on this information two compelling reasons exist to consider IN delivery of naloxone for acute opiate overdoses: The reduction of needle stick risk to rescue providers and the possibility of lay person naloxone delivery. While the intranasal option for delivering naloxone is not necessarily more effective than traditional intramuscular or intravenous injection methods, it is easier to deliver and often works as well as an injection. Most importantly to health care workers, intranasal naloxone delivery eliminates the risk of a contaminated needle stick. Needle stick injury is not a minor issue. Blood borne exposures are an occupational hazard that healthcare providers face daily. The CDC estimates that 600,000-800,000 percutaneous injuries with contaminated sharps occur yearly in the United States. With the increasing prevalence of blood born pathogens such as human immunodeficiency virus (HIV), hepatitis B virus (HBV) and hepatitis C virus (HCV) accidental needle stick injury may pose a life-changing and possibly life-ending event for affected health care workers. This risk is higher in the prehospital environment where a combination of patient and environmental factors make needle stick injury more likely. Marcus et al found an HIV seroprevalence rate of 4.1 to 8.9 per 100 patient visits in three inner-city ED populations. Because the annual blood contact for an individual EMS worker (Emergency Medical Services – paramedic) has been estimated to be as high as 12.3 per year, concern exists regarding the risk of viral seroconversion in EMS providers. Several authors have validated this concern. Valenzuela et al reported a five-fold higher prevalence of Hepatitis B (HBV) infection in paramedics than that observed in a comparable population from the same city. Pepe et al noted a strong association between years of employment and the rate of HBV infections in EMS workers. Although there is less risk today with the advent of HBV vaccines and use of universal precautions, the risk for other exposures remains significant. An especially high-risk patient population to EMS providers is the IVDU. These patients have HIV, HBV and Hepatitis C (HBC) seroprevalence rates that are far higher than the baseline population. In addition, EMS personnel commonly are involved in their care for life threatening illnesses such as respiratory arrest from opiate overdose. Furthermore, unique EMS environmental conditions such as combative patients, uncontrolled scene issues, poor lighting and moving ambulances make the probability of suffering a needle stick even more likely than in more controlled medical settings. Since opiate overdose patients rarely need an IV for any reason beyond the administration of naloxone, a needleless method of administering naloxone would eliminate needle stick risk and potential transmission of blood borne pathogens. [4-6] Effective methods of reducing needles stick risk to emergency providers in this situation should be welcomed. Intra-nasal naloxone is one such therapeutic intervention that may have a role in opiate toxic patients. [14, 15] The literature review that follows will discuss the results of currently published trials investigating IN naloxone in the prehospital environment. As of 2014 the clinical need for layperson administered naloxone has become overwhelming due to evidence of its efficacy (see data below) and the epidemic of opiate induced deaths that have occurred world wide but especially in the USA where 80% of all prescription opioids are consumed. This had led to a plethora of new laws approving layperson and BLS administered naloxone and great deal of literature on the topic. Massachusetts, specifically the Boston area, has been one of the ground breaking areas in terms of advancing the cause of expanded naloxone access to basic life support personnel (Firefighters, EMT basics, police) and the lay public. They have also led the country in academic level research on the topic. In 2014 they provided a plethora of new insights into this topic. From their EMS agency we get a large review of experience with BLS level data from 2006-2012. Weiner et al conducted a retrospective review of 7 years data where the city of Boston BLS providers administered intranasal naloxone to suspected opiate overdose patients. A total of 793 uses were identified and 724 charts were found to match with ED records. 689 (95.2%) of patients given naloxone by BLS providers responded to the drug. Only 8.8% required another dose in the ED. 507 (70%) were discharged home. The authors conclude that out-of-hospital administration of BLS naloxone was effective in the vast majority of opiate overdose cases and only a small percentage of patients required additional ED interventions. (In 2013 the BLS service administered another 458 doses of naloxone in the field). Davis et al provide additional insights into BLS administered (firefighter and police first responders) naloxone in the area surrounding Boston. [Free open access article click here] These communities already have demonstrable reductions in fatalities from opiate overdoses due to lay public administered naloxone and now have another layer of safety introduced to intervene in the current epidemic of opiate induced deaths. Other communities are now showing promising results from naloxone programs. Rando et al report historical data on a community’s death rate from opioid overdose (Lorraine OH) before and after introduction of police administered nasal naloxone. The death rate per quarter increased from 5.5 in 2011 to 15.3 for 2012 and peaked at 16.3 for 2013. After introduction of police officer delivered naloxone the death rate receded to 13.4 over the next year. Ray et al demonstrated that the police are very supportive of these police administered naloxone programs even though it puts additional burdens upon them. Fareed et al provide data showing us that the Veterans health administration has implemented an initiative to provide education to veterans and their families about opioid overdoses and to provide nasal naloxone rescue kits. They recommend that public health administrators and policy makers advocate for the implementation of these programs to reduce the rising number of overdose deaths in the United states and worldwide. Dwey et al discuss the feasibility and efficacy of overdose education and home naloxone use when implemented out of an ER setting. They found it was feasible to implement but difficult to quantify efficacy due to difficult follow-up. Dahlem et al provide insights into developing a take home IN naloxone program at a homeless shelter. They found this program effective and safe and recommend implementation in clinical practice. Han et al noted that introducing home IN naloxone programs to outpatient centers provides an intervention that makes the doctors and providers more satisfied with their interactions with this difficult patient population. Information related to layperson administration of naloxone continues to emerge. In 2015 Behar et al note that brief educational training (only 5-10 minutes) was sufficient to ensure adequate knowledge in layperson users for using take home naloxone. Ray et al interviewed police officers following their training to use IN naloxone as a recue therapy. They found that “The officers had overwhelmingly positive feelings about the training, that it was not difficult, and that other officers should be trained to use naloxone.”  Richert interviewed users attitudes to recue therapy and concluded that the simplest method of naloxone delivery (Intranasal) was probably the most likely method that users would be willing to administer. Wermeling continues to publish review topics on the concept with the most up to date information related to new drug formulations including that which his company is producing. The state of New Mexico allows both their basic life support [BLS] providers (police and highway patrol) to administer IN naloxone and they send IN delivery kits home with families of known opiate addicts in an attempt to reduce the high rate of opiate overdose deaths in their state. Similar community efforts are now ongoing in multiple states including Massachusetts (NOMAD program), New York and North Carolina (Project Lazarus). Maya Doe-Simkins published preliminary data form the greater Boston area experience with lay person administered intranasal naloxone, noting a total 385 participants trained and 74 successful opiate overdose reversals - leading to reduced EMS and ER utilization and likely reduced mortality. (Click here for the article) . Since the publication of the article, the system (INPEDE OD study - N.O.M.A.D. program) now reports 755 opioid overdose reversals with that number growing daily. (click here for 2011 report). The February 17, 2012 Morbidity and Mortality Weekly Report (MMWR) published by the CDC discusses the community based opioid overdose prevention programs that exist in the USA, most of which pass out naloxone as either intranasal or intramuscular forms of delivery. (Click here for a link). This report states that over 53,000 laypersons have been trained with a reported successful reversal of over 10,000 patients who have overdosed. At least 15 states have existing programs. This report was featured in Time magazine (click here for link) where the authors suggest this should be made an over the counter therapy (another link on this here) and suggest that the FDA will be considering this in the spring of 2012. As described above the NOMAD program has been quite successful using layperson administered intranasal naloxone combined with rescue breathing until the naloxone has had a chance to work. As of September 2011 they report over 1000 successful overdose reversals. The same group who was involved in the NOMAD program established an Overdose education and naloxone distribution (OEND) program for patients in Massachusetts who were being started on methadone. They distributed kits to 1553 new methadone maintenance patients and reported 92 naloxone rescues as a result. Interestingly, though prescription opiates are now more commonly associated with death than heroin, in this group of methadone patients, the vast majority of the naloxone rescues occurred on witnessed heroin overdoses. New York City also reports approximately 300 opiate reversals and growing using a similar program. As of the fall of 2015, CVS pharmacy now sells naloxone kits over the counter in 14 states: Those states include Arkansas, California, Minnesota, Mississippi, Montana, New Jersey, North Dakota, Pennsylvania, South Carolina, Tennessee, Utah, and Wisconsin. Naloxone is already available over the counter at CVS stores in Rhode Island and Massachusetts. IN 2016 Krieter et al present initial pharmacokinetic data regarding the newly available prepackaged IN naloxone product marketed by Aptar. Bottom line is that IN naloxone (4 mg) results in higher plasma concentrations of drug than the intramuscular dose (0.4 mg) yet does not require any injection. They also found that over 90% of the lay public could use the product with no prior training. If this product is priced at an affordable cost, I predict it will displace all other forms and could become a huge commercial success going home with everyone on long term opiates. However, given recent (2016) obvious greed and over-pricing of life saving home medications such as Epi Pens, I will believe this when I see it. Unfortunately the trend, as with many pharmaceuticals now, is an upward push on prices for any drug that is controlled by a single manufacturer. Rosenberg reports a similar trend for all forms of naloxone. Multiple states and city's allow IN naloxone delivery by lay persons so it makes sense that they allow their BLS providers to also administer this potentially lifesaving medication. In 2005 Boston EMS approved IN naloxone for their EMS providers. In 2006 they reported a 75% success rate in reversal of opioid overdose when BLS providers delivered IN naloxone. (Click here for a slide presentation on the topic.) In a more complete 5 years study they found IN naloxone delivered by BLS to be 70% effective with rare incidence of acute agitation. they did find it to seem to be slower than injectable naloxone (which is similar to Kerr data from Australia) - not perfect but no need for a shot. (Click here for slide presentation for Boston 2005-2009 BLS data). In an accompanying editorial, Compton et al  review the FDA views on the topic – which are extremely favorable towards prescription home naloxone and eventually over the counter naloxone. At this point the FDA is fully aware of the off-label lay person use of naloxone both nasally and Intramuscularly and applauds this movement but hopes to encourage the pharmaceutical industry to develop easily administered and more highly controlled forms of this medication. Editorial comment: Is a year of your life worth $438-$14,000? Is it worth saving someone else's life – often a young adult - so they can go on to experience life for decades to come? I doubt this is a very hard decision and I find it amazing and sad when I hear some clinicians or politicians comment on the ethics of distributing naloxone to lay people and their concern that it will increase risk taking. They are spouting uninformed rumors rather than evidence. Even were they correct, are we to infer that these patients are disposable humans not worth this trivial cost? They should read some of the articles reviewed on this page that actually show REDUCED risky behavior in the cohort of injection users who are trained to use rescue naloxone - this knowledge elevates them within their peer community and gives them an increased sense of worth that frequently leads to reductions in opioid use. In 2016 Fisher et al published data demonstrating that non-medical first responders (police) are fully capable or delivering IN naloxone to appropriate candidates. The data is essentially identical to EMS data - noting over 80% effective response to the drug (breathing). Only one case (out of 126 patients) led to combativeness – also confirming the low incidence of agitation following IN naloxone delivery. Gulec et al analyzed appropriateness and effectiveness of naloxone delivery by BLS versus ALS providers over a two year period. They had 3219 cases to analyze and found no differences between the two groups. They conclude that intranasal naloxone delivered by BLS is as effective and given as appropriately as any naloxone given by ALS. They recommend the the National EMS scope of practice guidelines include BLS administration of nasal naloxone for suspected opioid overdoses. The increasing use of naloxone has allowed better analysis of single dose versus multiple dose requirements. Klebacher found that about 9% of all opiate overdoses need at least on repeat dose while 2-3% required three or more doses. Weiner et al report on 6 years experience with BLS administration of nasal naloxone to 793 patients. They reviewed all ED charts and found that 95% had a clinical response and that 9% eventually needed an additional dose (the same percentage as seen in the 2017 Klebacher et al study reference 62). They conclude that BLS administration is effective and safe. Editorial comment: This data is important because it shows that if left alone without ALS intervention, generic nasal naloxone (which is probably a bit dilute) is effective in the same percentage of patients as the more expensive highly concentrated formulations. The point being – if your budget is limited this therapy may be more cost effective than trade name IN Narcan and just as clinically effective. The evidence increasingly supports the effectiveness and safety of layperson administered naloxone. Furthermore, the USA is in the throngs of a major epidemic of opiate overdose deaths from prescription pain medications with some states death rates exceeding that of motor vehicle crashes, homicides, and many other causes of death in young adults. Hopefully we will see the FDA make this a non-prescription therapy in the very near future. 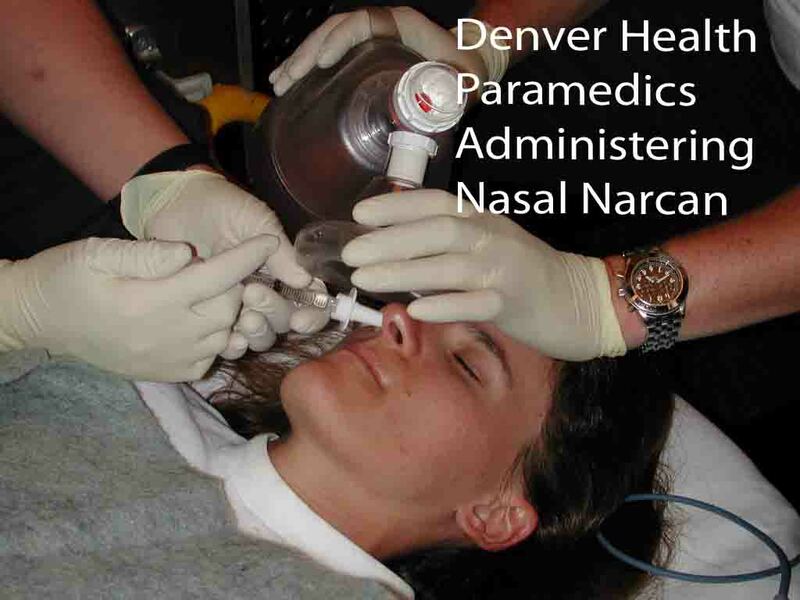 The Denver Health Paramedic system investigated the efficacy and safety of atomized intranasal naloxone for the treatment of suspected opiate overdose. Study patients were given 2 mg of IN naloxone (1mg/ml up each nostril) upon initial contact. After intranasal naloxone, standard protocols were followed including airway management, IV placement, and administration of IV naloxone. Ninety-five patients were enrolled. Fifty-two patients responded to naloxone: 43 (83%) to IN naloxone alone, 9 (17%) to IV following IN naloxone. Four of these "non-responders" had IV naloxone so rapidly (less than 3 minutes) that it is likely the nasal naloxone did not have time to produce a clinical effect. An additional four of the nine "non-responders" had anatomic abnormalities that may have prevented intranasal medication absorption (epistaxis, nasal trauma, nasal septal abnormalities). The median times from arrival at patient side to awakening and from administration of the IN naloxone to patient awakening were 8.0 minutes and 3.0 minutes respectively. These median times to awakening after arrival and naloxone administration are less than those reported by Wanger et al for intravenous naloxone (9.3 minutes and 3.8 minutes) or subcutaneous naloxone (9.6 minutes and 5.5 minutes). Even though this was a limited study, the authors concluded that IN naloxone can be effective in the field (83% initial response rate), acts rapidly and could potentially reduce the risk of paramedic needle sticks in this population. Kelly et al conducted a similar EMS study, comparing intranasal naloxone to intramuscular naloxone in 155 prehospital opiate overdose cases. Unfortunately they did not have access to concentrated naloxone and had to use 2 mg of naloxone in 5 ml of solution – a volume that would be predicted to be less effective due to run-off into the throat (See intranasal medication delivery overview section of this web site). Nevertheless, they still found both treatments equivalent in terms of opiate reversal (74-83%) though IM naloxone worked faster. Interestingly, only 2% of patients given intranasal naloxone experienced agitation or irritation upon awakening, a difference they attributed to the gradual absorption and gradual awakening seen with intranasal naloxone. This finding was felt to be an advantage of IN naloxone, since the rapid awakening and hypoxic agitation seen with administration of IV naloxone is of considerable concern to some EMS providers. Based on this data and the considerable danger of needle stick exposure in this patient population, these authors conclude that IN naloxone should be the first line therapy for opiate overdose in the prehospital setting. Robertson et al reviewed their EMS data on 154 opiate overdoses requiring rescue naloxone over a 17 month period. They found that the EMS providers used IV naloxone 104 times and IN naloxone 50 times. The mean time from arrival at scene to awakening was identical for both delivery routes (about 20 minutes) though naloxone was faster in onset once an IV was established (8 minutes versus 12 minutes). 34% of patients in the naloxone grip were given a second dose, while 18% in the IV group needed a second dose. The authors conclude "Given the difficulty and potential hazards in obtaining IV access in many patients with narcotic overdose, IN naloxone appears to be a useful and potentially safer alternative." Merlin et al did a retrospective review of all naloxone administration in their single 6 truck EMS system over a two year period. They then eliminated all cases that did not have confirmed opiate overdose (admitted by patient or family, found with paraphernalia of opiate injection, confirmed by urine toxicology screen). Using this strict inclusion criteria they found 96 cases of opiate overdose treated with naloxone. Of these cases 55 received IV naloxone, 38 intranasal and 3 intramuscular. Comparing baseline respiratory rates and change in Glasgow coma scores they found no statistical difference: IV naloxone patients had increase in respirations from 10/minute to 18/minute and GCS increase from 4 to 15. IN naloxone patients had increase in respirations from 10/minute to 16/minute and GCS increase from 3 to 12. The authors conclude that "among subjects with confirmed opioid overdose, intranasal naloxone is as effective as intravenous naloxone at reversing central nervous system depressive effects caused by opioids." A trial of concentrated intranasal naloxone [2mg Naloxone in 1mL] for suspected heroin overdose was done in the prehospital setting in Melbourne, Victoria. The findings were published in December 2009. They compared 172 patients randomized to IN versus IM naloxone. Response rates and times were the same after 1 dose (72% vs. 78%, 8.0 versus 7.9 minutes onset, p=NS). 18% of the IN patients were redosed for a total response rate of 82%. The authors conclude that intranasal naloxone is effective and safe and offers a needle-less method of treating heroin / opiate overdoses. Other publications suggests that IN naloxone should move from the realm of ALS to that of BLS, allowing all first responders to administer this medication intranasally to any comatose patient at risk of opiate overdose. McDermott demonstrated that paramedics felt IN naloxone was faster to deliver, better accepted and perceived as safer than IV naloxone and that this route should be considered more frequently as first line therapy. Sabzghabaee et al conducted a prospective RCT comparing IN naloxone (0.4 mg) to IV naloxone (0.4 mg) in 100 patients who overdosed on opiates. All patients were delivered the study drug and had their ventilation supported for 5 minutes. After 5 minutes those who failed to respond were administered a second dose – it is not clear from the paper how many patients required redosing. The primary outcome was level of consciousness with secondary outcomes of vital signs (primary interest was respiratory rate), time to response, oxygen saturation and side effects (agitation). They found both treatment regimens equivalent in reversing both respiratory depression and CNS depression. 100% of the IN group progressed to a state of either lethargy or full consciousness following naloxone delivery compared to only 60% of the IV group (the remaining 40% were obtunded and breathing but no longer comatose). The time to response following drug delivery was 2.56 minutes for the nasal route versus 1.48 minutes via the IV route. There was no difference in respiratory rate improvement. Mean arterial saturations increased from 71% to 94% (IN) and 73% to 94% (IV). Agitation was observed in 12 of 50 patients receiving IV naloxone but in no patients receiving IN naloxone. The authors conclude that IN naloxone is as effective as IV naloxone in reversing both opiate induced respiratory depression and CNS depression, but that the nasal form leads to less severe withdrawal symptoms following delivery and is therefore preferred. Editorial note: This is a very important article for those interested in the efficacy, side effects and dosing of nasal naloxone. All prior studies used a dose of 2 mg for nasal delivery so that was the only evidenced based recommendation possible for dosing. This study used 0.4 mg for the nasal dose and found it equivalent to the IV formulation for the primary goal of delivery – patient arousal and breathing. It would be nice to have at least one additional study to confirm this finding, but if this data is confirmed by others it opens the door to using alternate formulations of naloxone (0.4 mg/ml - much less expensive and more readily available than the concentrated form) for nasal delivery. I believe we need another confirmatory study prior to jumping on this concept because there are a number of missing data points (percentage of patients who required redosing) and some findings that don’t seem right (better arousal with IN than with IV drug). Until these are clarified I would be cautious on drawing firm conclusions. Another important point here is the risk of the patient becoming agitated and going into acute narcotic withdrawal. These authors demonstrate what has been reported previously: IN naloxone results in less risk of severe opiate withdrawal. I hypothesize that this is due to the absorption kinetics of the IN route being more prolonged and gentler(slow increase in breathing, oxygenation and awakening) in terms of arousal than the sudden hit and awakening (while still hypoxic) that occurs with an IV bolus. The information provided by these studies is important in terms of needle stick risk reduction. Accidental needle sticks resulting from a patient who is an IV drug abuser are emotionally draining for the employee as well as his family. In addition, the medications used for post-exposure prophylaxis for HIV are expensive and frequently result in major side effects. By administering naloxone intranasally, needle stick risk can be reduced. This improves the safety of the work environment and eliminates the professional, personal and family turmoil that may occur should a provider incur a needle stick from an IV drug abuser. While IN medication delivery is an exciting new method for delivering medications in the EMS setting, it is not a panacea. Being aware of limitations is an important step in appropriate utilization of this therapy. Key issues that must be addressed up front are the medication dose, volume and delivery method. Once the medication and delivery method are determined there are several other issues that will improve field experience: First, be aware of clinical situations where nasal delivery may be suboptimal. Inspect the patient’s nostrils for large amounts of mucus, blood or other problems that might inhibit absorption. If abnormalities are present, consider other routes for drug administration, as there may be an increased risk of failure. A few of the failures noted for IN naloxone administration in the Denver EMS study was due to the presence of epistaxis in the patient. Second, deliver the medication without delay to allow time for effective absorption. Third, relax and reassess for a few minutes. If the clinical problem fails to resolve with the intranasal medication consider two things: The nasal route was not effective or the diagnosis is wrong. (It is fairly clear from the literature that the later is most likely the case - in every study that looked at it most patients receiving naloxone in any form did not have opiate overdoses. [14,23]) In situations where a comatose patient fails to awaken with naloxone, continue to support breathing and circulation, administer naloxone via the IM or IV route and consider alternate causes for the coma. Debra Kerr, PhD Candidate, Senior Fellow – Emergency Medicine Research, Melbourne Australia ….. Rapid depression of the syringe (to atomize the drug out of the atomiser) is important and avoids respiratory administration. For paramedic use, response times may affect acceptability of IN administration as first line medication. Delay in clearance from overdose scene may reduce response times to next patient. Naloxone is not currently manufactured in a form suitable for IN administration. We had the drug manufactured by a private pharmaceutical company for the purpose of the (recent) trial. Also, the drug is not approved for IN administration by Australian legislative authorities. Anecdotally, paramedics are very keen to administer Naloxone via the IN route to reduce BBV transmission risk. Acceptability for rousable patients has not been tested. Our studies only included unrousable patients. Erik D. Barton, MD, MS, MBA; Chief of Emergency Medicine, The University of Utah, Salt Lake City….. The biggest benefit we can offer any provider who is trying to care for IVDU’s who accidentally overdose on injected opiates is safety from blood exposure. Blood-borne exposures can be both physically and emotionally devastating to non-abusers (and their families!) who were just trying to save a life. There is often a period of several months to years in which monitoring for hepatitis and HIV seroconversion must occur. The IN route offers an immediate, noninvasive, and nearly risk-free opportunity to intervene with these patients by any first-responder: family members, police, fire, EMS, and even the ED. There is no downside to attempting such a noninvasive maneuver in a suspected IVDU FIRST as long as other resuscitative efforts are not significantly delayed, especially when the benefits to the patient and provider, as described above, significantly outweigh the risks. Tim Wolfe, MD, emergency medicine specialist, prior academician (Associate professor, University of Utah, Salt Lake City), inventor of the MAD mucosal atomization device.... Interestingly, the mean time from heroin injection to death in fatal overdoses is 60-70 minutes. This tells us that the drug itself is only part of the issue in the final apneic cardiac arrest, otherwise they would die in 5-10 minutes. I suspect, as do others who taught me this, that opiate induced respiratory depression leads to hypercarbia (high CO2 in the blood due to reduced respiratory rate). This in turn leads to further suppression of the ventilatory drive, further hypercarbia and eventually such severe hypoxia that the patient arrests. The point of course is the importance of supportive ventilation which alone may lead to patient arousal without naloxone. As emergency providers we can get very excited and impatient with nasal naloxone, expecting instant results from a drug we provide (we are driven by the unknown, fears of failure and adrenaline responses). My suggestion - relax, begin bag ventilation (reduces their hypercarbia), administer the nasal naloxone and be patient. It takes 3-5 minutes for any effect (note that IV naloxone takes about 3 minutes after administration - and it requires the time to start an IV) and up to 10 minutes for awakening. Generally they are not as agitated with nasal naloxone (probably due to less hypoxia when they finally awaken) and sometimes they are not fully awake- just breathing which is really our primary goal. Adapt Pharma company announced formal FDA approval of a 4 mg/0.1 ml single dose, single nostril formulation of naloxone - NARCAN Nasal spray. They also acquired the trademark brand name "Narcan." Sales are expected to begin in the USA early in 2016. They have special pricing for first responders and community based treatment programs of $37.50 per preloaded device. Editorial comment: Even though I invented the MAD nasal, began the research on nasal naloxone in the 1990s and have used this therapy for 18 years (so have a bit of a historical bent towards the original method of delivery), it seems pretty apparent to me that this new product is probably a better method for delivery of nasal naloxone than the way we have posted here on this website for the last 7 years. The new formulation is more appropriately concentrated, it has a pre-attached atomizer and because of the recent price increased in generic naloxone (single supplier cranked the price last year) this new formulation is not only better formulated, its also less expensive (in 2016). If they continue pricing it properly they should replace all generic "home made" kit formulations, if not - as of late 2017 - the research data does not show any better results than less concentrated generic formulations so the end user will need to decide which formulation to choose based on budget and convenience issues. I hope the company keeps this life saving drug at a reasonable price. Briskly compress syringe to administer 1 ml of atomized spray. If no arousal occurs after 5-10 minutes, proceed down standard unconscious protocol including injectable naloxone and secure airway if necessary. Comment 2: IN naloxone is now being used at a BLS, law enforcement and layperson level with good success. Kerr, D., A. M. Kelly, et al. (2009). Randomized controlled trial comparing the effectiveness and safety of intranasal and intramuscular naloxone for the treatment of suspected heroin overdose. Addiction 104(12): 2067-74. Sabzghabaee, A. M., N. Eizadi-Mood, et al. (2014). "Naloxone therapy in opioid overdose patients: intranasal or intravenous? A randomized clinical trial." Arch Med Sci 10(2): 309-314. Davis, C.S., et al., Expanded access to naloxone among firefighters, police officers, and emergency medical technicians in Massachusetts. Am J Public Health, 2014. 104(8): p. e7-9. Doe-Simkins, M., et al., Overdose rescues by trained and untrained participants and change in opioid use among substance-using participants in overdose education and naloxone distribution programs: a retrospective cohort study. BMC Public Health, 2014. 14: p. 297. Samuels, E., Emergency department naloxone distribution: a rhode island department of health, recovery community, and emergency department partnership to reduce opioid overdose deaths. R I Med J (2013), 2014. 97(10): p. 38-9. Doyon, S., S. E. Aks, et al. (2014). "Expanding access to naloxone in the United States." J Med Toxicol 10(4): 431-434. National association of Drug Diversion Investigators (NADDI) statement of support for law enforcement officers to carry intranasal naloxone. United Kingdom Advisory Council on the misuse of drugs - White paper recommending expanded access to naloxone to prevent reversible deaths. Today show 2014 Video interview of a mother who saved her son's life using intranasal naloxone at home. 1. Marcus, R., et al., Risk of human immunodeficiency virus infection among emergency department workers. Am J Med, 1993. 94(4): p. 363-70. 2. Kelen, G.D., et al., Hepatitis B and hepatitis C in emergency department patients. N Engl J Med, 1992. 326(21): p. 1399-404. 3. Baker, J.L., et al., Unsuspected human immunodeficiency virus in critically ill emergency patients. Jama, 1987. 257(19): p. 2609-11. 4. Osterwalder, J.J., Patients intoxicated with heroin or heroin mixtures: how long should they be monitored? Eur J Emerg Med, 1995. 2(2): p. 97-101. 5. Vilke, G.M., et al., Are heroin overdose deaths related to patient release after prehospital treatment with naloxone? Prehosp Emerg Care, 1999. 3(3): p. 183-6. 6. Smith, D.A., et al., Is admission after intravenous heroin overdose necessary? Ann Emerg Med, 1992. 21(11): p. 1326-30. 7. Hussain, A., R. Kimura, and C.H. Huang, Nasal absorption of naloxone and buprenorphine in rats. Int J Pharm, 1984. 21: p. 233-237. 8. Loimer, N., P. Hofmann, and H.R. Chaudhry, Nasal administration of naloxone is as effective as the intravenous route in opiate addicts. Int J Addict, 1994. 29(6): p. 819-27. 10. Wolfe, T.R. and E.D. Barton, Reducing needlestick risk: Nasal drug delivery in EMS. J Emerg Med Serv JEMS, 2003. 28(12): p. 52-63. 11. Marcus, R., et al., Occupational blood contact among prehospital providers. Ann Emerg Med, 1995. 25(6): p. 776-9. 12. Valenzuela, T.D., et al., Occupational exposure to hepatitis B in paramedics. Arch Intern Med, 1985. 145(11): p. 1976-7. 13. Pepe, P.E., et al., Viral hepatitis risk in urban emergency medical services personnel. Ann Emerg Med, 1986. 15(4): p. 454-7. 14. 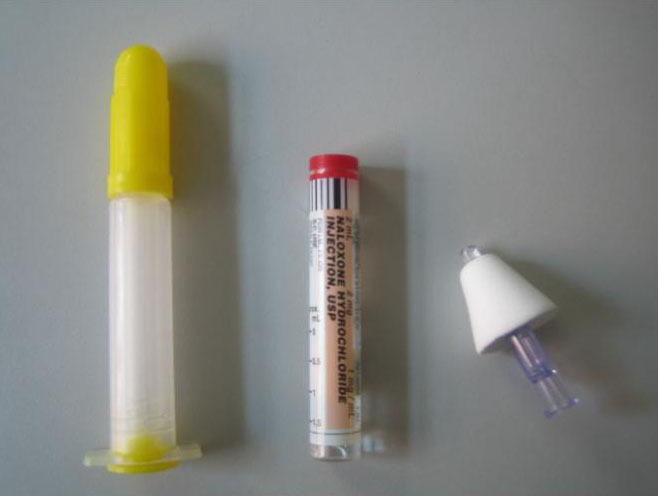 Barton, et al., Efficacy of intranasal naloxone as a needleless alternative for treatment of opioid overdose in the prehospital setting. J Emerg Med, 2005. 29(3): p. 265-71. 15. Kelly, et al., Randomised trial of intranasal versus intramuscular naloxone in prehospital treatment for suspected opioid overdose. Med J Aust, 2005. 182(1): p. 24-7. 16. Martin, T.G., Take home naloxone: feasability, safety and efficacy. J Toxicol Clin Toxicol, 2003. 41(4): p. 415-416. 17. Belz, D., et al., Naloxone use in a tiered-response emergency medical services system. Prehosp Emerg Care, 2006. 10(4): p. 468-71. 18. Baca, C.T. and K.J. Grant, Take-home naloxone to reduce heroin death. Addiction, 2005. 100(12): p. 1823-31. 19. Wanger, K., et al., Intravenous vs subcutaneous naloxone for out-of-hospital management of presumed opioid overdose. Acad Emerg Med, 1998. 5(4): p. 293-9. 20. Parkin, J.M., et al., Tolerability and side-effects of post-exposure prophylaxis for HIV infection. Lancet, 2000. 355(9205): p. 722-3. 21. 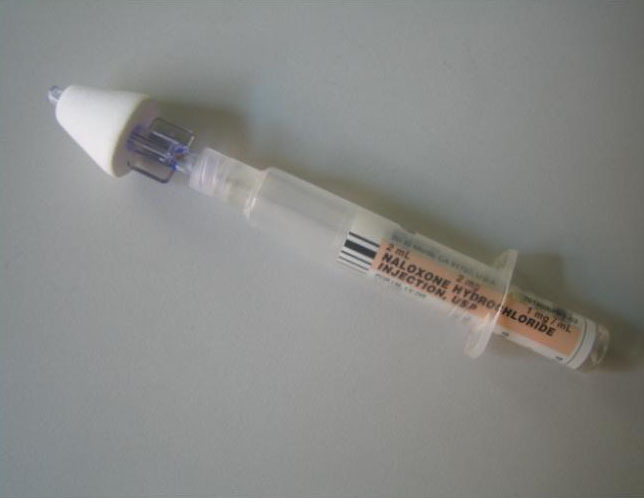 Robertson, T.M., et al., Intranasal naloxone is a viable alternative to intravenous naloxone for prehospital narcotic overdose. Prehosp Emerg Care, 2009. 13(4): p. 512-5. 22. Doe-Simkins, M., et al., Saved by the nose: bystander-administered intranasal naloxone hydrochloride for opioid overdose. Am J Public Health, 2009. 99(5): p. 788-91. 24. Kerr, D., A. M. Kelly, et al. (2009). "Randomized controlled trial comparing the effectiveness and safety of intranasal and intramuscular naloxone for the treatment of suspected heroin overdose." Addiction 104(12): 2067-74. 25. Wermeling, D. P. (2010). "Opioid harm reduction strategies: focus on expanded access to intranasal naloxone." Pharmacotherapy 30(7): 627-631. 26. McDermott, C. and N. C. Collins (2012). "Prehospital medication administration: a randomised study comparing intranasal and intravenous routes." Emerg Med Int 2012: 476161. 27. Walley, A. Y., M. Doe-Simkins, et al. (2012). "Opioid overdose prevention with intranasal naloxone among people who take methadone." J Subst Abuse Treat. 29. Coffin, P. O. and S. D. Sullivan (2013). 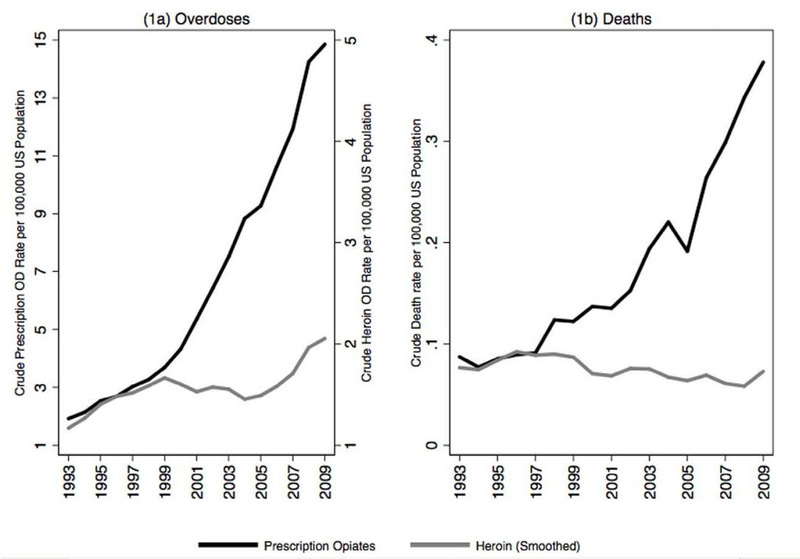 "Cost-effectiveness of distributing naloxone to heroin users for lay overdose reversal." Ann Intern Med 158(1): 1-9. 30.Compton, W. M., N. D. Volkow, et al. (2013). "Expanded access to opioid overdose intervention: research, practice, and policy needs." Ann Intern Med 158(1): 65-66. 31. Sabzghabaee, A. M., N. Eizadi-Mood, et al. (2014). "Naloxone therapy in opioid overdose patients: intranasal or intravenous? A randomized clinical trial." Arch Med Sci 10(2): 309-314. 32. Weiner, S.G., et al., Use of intranasal naloxone by basic life support providers. Ann Emerg Med, 2014. 64(4): p. S52 (Abstract 144). 33. Davis, C.S., et al., Expanded access to naloxone among firefighters, police officers, and emergency medical technicians in Massachusetts. Am J Public Health, 2014. 104(8): p. e7-9. 34. Doe-Simkins, M., et al., Overdose rescues by trained and untrained participants and change in opioid use among substance-using participants in overdose education and naloxone distribution programs: a retrospective cohort study. BMC Public Health, 2014. 14: p. 297. 35. Seal, K.H., et al., Attitudes about prescribing take-home naloxone to injection drug users for the management of heroin overdose: a survey of street-recruited injectors in the San Francisco Bay Area. J Urban Health, 2003. 80(2): p. 291-301. 36. Seal, K.H., et al., Naloxone distribution and cardiopulmonary resuscitation training for injection drug users to prevent heroin overdose death: a pilot intervention study. J Urban Health, 2005. 82(2): p. 303-11. 37. Wagner, K.D., et al., Evaluation of an overdose prevention and response training programme for injection drug users in the Skid Row area of Los Angeles, CA. Int J Drug Policy, 2010. 21(3): p. 186-93. 38. Wagner, K.D., et al., "I felt like a superhero": the experience of responding to drug overdose among individuals trained in overdose prevention. Int J Drug Policy, 2014. 25(1): p. 157-65. 39. Galea, S., et al., Provision of naloxone to injection drug users as an overdose prevention strategy: early evidence from a pilot study in New York City. Addict Behav, 2006. 31(5): p. 907-12. 40. Bailey, A.M. and D.P. Wermeling, Naloxone for Opioid Overdose Prevention: Pharmacists' Role in Community-Based Practice Settings. Ann Pharmacother, 2014. 41. Samuels, E., Emergency department naloxone distribution: a rhode island department of health, recovery community, and emergency department partnership to reduce opioid overdose deaths. R I Med J (2013), 2014. 97(10): p. 38-9. 42. Green, T.C., et al., Two cases of intranasal naloxone self-administration in opioid overdose. Subst Abus, 2014. 35(2): p. 129-32. 43. Lenton, S., et al., Working together: Expanding the availability of naloxone for peer administration to prevent opioid overdose deaths in the Australian Capital Territory and beyond. Drug Alcohol Rev, 2014. 44. Zuckerman, M., S.N. Weisberg, and E.W. Boyer, Pitfalls of intranasal naloxone. Prehosp Emerg Care, 2014. 18(4): p. 550-4. 45. Hammett, T.M., et al., Pharmacies as providers of expanded health services for people who inject drugs: a review of laws, policies, and barriers in six countries. BMC Health Serv Res, 2014. 14: p. 261. 46. Behar E, Santos GM, Wheeler E, Rowe C, Coffin PO. Brief overdose education is sufficient for naloxone distribution to opioid users. Drug Alcohol Depend 2015;148:209-12. 47. Ray B, O'Donnell D, Kahre K. Police officer attitudes towards intranasal naloxone training. Drug Alcohol Depend 2015;146:107-10. 48. Richert T. Wasted, overdosed, or beyond saving - To act or not to act? Heroin users' views, assessments, and responses to witnessed overdoses in Malmo, Sweden. The International journal on drug policy 2015;26:92-9. 49. Wermeling DP. Review of naloxone safety for opioid overdose: practical considerations for new technology and expanded public access. Therapeutic advances in drug safety 2015;6:20-31. 50. Rando, J., D. Broering, et al. (2015). "Intranasal naloxone administration by police first responders is associated with decreased opioid overdose deaths." Am J Emerg Med. 51. Fareed, A., A. M. Buchanan-Cummings, et al. (2015). "Reversal of overdose on fentanyl being illicitly sold as heroin with naloxone nasal spray: A case report." Am J Addict 24(5): 388-390. 52. Dwyer, K., A. Y. Walley, et al. (2015). "Opioid education and nasal naloxone rescue kits in the emergency department." West J Emerg Med 16(3): 381-384. 53. Dahlem, C. H., M. J. Horstman, et al. (2015). "Development and implementation of intranasal naloxone opioid overdose response protocol at a homeless health clinic." J Am Assoc Nurse Pract. 54. Fisher, R., D. O'Donnell, et al. (2016). "Police Officers Can Safely and Effectively Administer Intranasal Naloxone." Prehosp Emerg Care: 1-6. 55. Akers, J. L., R. N. Hansen, et al. (2017). "Implementing take-home naloxone in an urban community pharmacy." J Am Pharm Assoc (2003) 57(2S): S161-S167. 56. Barry, T., J. Klimas, et al. (2017). "Opiate addiction and overdose: experiences, attitudes, and appetite for community naloxone provision." Br J Gen Pract 67(657): e267-e273. 57. Chang, G., M. Davids, et al. (2017). "Overdose education and naloxone distribution for veterans with opioid use disorder: Results from a pilot initiative." J Addict Dis 36(4): 217-221. 58. Heavey, S. C., A. M. Delmerico, et al. (2017). "Descriptive Epidemiology for Community-wide Naloxone Administration by Police Officers and Firefighters Responding to Opioid Overdose." J Community Health. 59. Kobayashi, L., T. C. Green, et al. (2017). 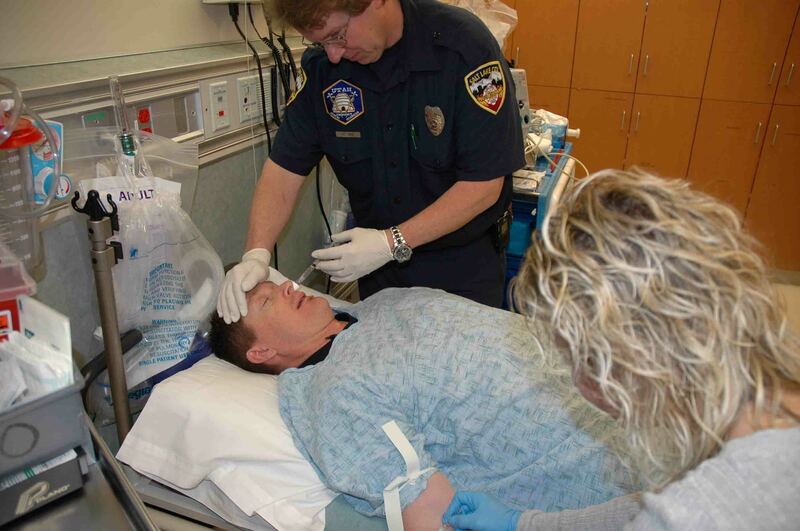 "Patient Simulation for Assessment of Layperson Management of Opioid Overdose With Intranasal Naloxone in a Recently Released Prisoner Cohort." Simul Healthc 12(1): 22-27. 60. Han, J. K., L. G. Hill, et al. (2017). "Naloxone Counseling for Harm Reduction and Patient Engagement." Fam Med 49(9): 730-733. 61. Gulec, N., J. Lahey, et al. (2017). "Basic and Advanced EMS Providers Are Equally Effective in Naloxone Administration for Opioid Overdose in Northern New England." Prehosp Emerg Care: 1-7. 62. Klebacher, R., M. I. Harris, et al. (2017). "Incidence of Naloxone Redosing in the Age of the New Opioid Epidemic." Prehosp Emerg Care: 1-6. 63. Weiner, S. G., P. M. Mitchell, et al. (2017). "Use of Intranasal Naloxone by Basic Life Support Providers." Prehosp Emerg Care 21(3): 322-326. 64. Rosenberg, M., G. Chai, et al. (2018). "Trends and economic drivers for United States naloxone pricing, January 2006 to February 2017." Addict Behav 86: 86-89.